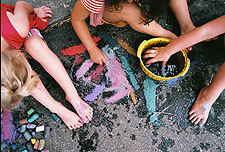 Water and colorful chalk are used to make art on the pavement. A TREE IS CUT DOWN, and we ask the man with the big truck full of chips if we can have them for our playground. The children spread the chips under our rope swing. They become an exciting material for creating a game. How to gather and sort the pieces? Two children put them in a wagon and place them on the white steps in the sun. As they explore the pieces, the sharp ones become the mark makers and the flat ones become the surface for this imaginative play. They quietly work in a team designing the game, discussing what they are doing, and producing solutions to the problems. These children have built themselves a house! THE CHILDREN WANT A HOUSE. One child begins a wall, bringing the bricks from various parts of the garden. A team begins to sort itself out. Who is the leader, and how will decisions be made? What are the rules of the game? A child places a rock on top of the bricks, and then the rest follow the lead. Another child places straw on top of the rocks, and the leftover planter boxes fit nicely over the straw. Everyone is pleased. Bring the chairs. We will sit in our house. 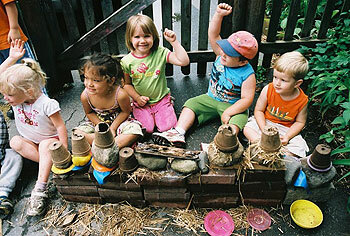 A community is formed of children who have built themselves a house. A TERRARIUM IS EMPTY, and when the chalk rubs against the screen, a noise is made. One child begins, then others follow. We place aluminum foil inside the glass tank, and the children watch the dust from the chalk fall into lovely piles of blue and pink and white. Small piles and large piles. My pile is taller. Mine is a rainbow! Then the colors mix and new surprises occur. Afterwards the children add water, and a new experiment is made using chalk paste, which is set in the sun and baked into little globs of chalk that are used to color the rocks around the garden where the kale grows. THE TURQUOISE TABLE IS IN THE SUN. A bucket of new clay is nearby. Several children gather to work together. They use the stones from the garden to flatten the clay. The straw from the ground is added for more texture. They discuss how to collaboratively shape the road. THE CHILDREN ARE HOT. They bring out the chalk. Cups of water are brought to the black top and poured onto the surface of the road. The children sit and choose the pastel colors. The chalk is rubbed into the rough surface of the ground. The pools form delightful eddies of swirling color. Two colors collide and create a new color. Small feet walk through the puddles of chalk and make bare foot prints. The older children write letters to mark their ground and inspire the younger children to imitate them. 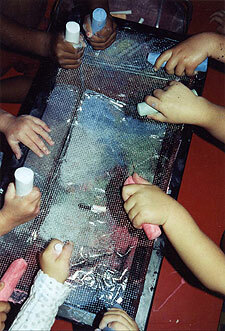 When they are inside, the sun dries the puddles, and the children are amazed at the vivid patterns they have made. Each of these stories represents the way simple materials can transform children into artists. 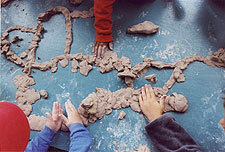 Through making art, children are practicing social skills and leadership skills. They are learning about themselves and their peers. The early years, when the minds of young children are able to be most naturally imaginative, is an essential time to encourage creative experiences. In celebration of the Month of the Young Child festivities, there will be a Young Children's Art Exhibit at the River Garden from 5:00 to 7:00 p.m. during Gallery Walk on Friday, April 1. Along with appreciating the artwork, families are invited to come for free family-friendly activities and healthy snacks, and to learn about area resources available to them. The event is sponsored by Windham Child Care Association, Building Bright Futures of Southeastern Vermont, and the Early Childhood Educators Network of Southeastern Vermont. The exhibit is the first of the month's schedule of over a dozen activities. For a listing of free events, go to www.windhamchildcare.org. Kay Curtis is an artist and the director of Happy Hands School. She can be reached at (802) 257-7235 or www.kaycurtis.com.